Pluto's loss of planetary status in 2006 remains controversial. Now a new definition is being proposed that would restore Pluto while increasing the number of "planets" in our solar system to over 110. Pluto's "demotion" to a dwarf planet back in 2006 is still a touchy subject, even among scientists. When you account for the fact that astronomers, who study stars and black holes, were the ones who decided on the definition of a planet that resulted in Pluto's declassification, it's understandable that various planetary scientists don't even want to talk about it. "It's often like bringing up politics and religion in polite conversation," said planetary geologist Kirby Runyon from Johns Hopkins University, in an email to Seeker. "Some planetary scientists can't understand why some of us care so much. Generally, it's not discussed over a beer at a conference." But Runyon does care. In fact, he's so passionate about what constitutes a planet, that he is the lead author of a new paper that proposes a new geophysical-based definition. This revised description is centered on intrinsic physical properties such as surface features instead of the extrinsic orbital characteristics that the International Astronomical Union (IAU) used as the basis of much of their planetary definition when they formulated it nearly 11 years ago. Runyon and his co-authors - including Alan Stern, the principal investigator of the New Horizons mission to Pluto - will present their paper at the 48th Lunar and Planetary Science Conference in March. The new paper states the definition of a planet as "a sub-stellar mass body that has never undergone nuclear fusion and that has sufficient self-gravitation to assume a spheroidal shape adequately described by a triaxial ellipsoid regardless of its orbital parameters." In other words: Anything round in space that isn't a star. While this definition is refreshingly simple - particularly compared to confusing requirements about clearing orbital zones - Runyon and his co-authors say that this definition is "in keeping with both sound scientific classification and peoples' intuition." But their proposed definition would increase the number of "planets" in our solar system to over 110, including Earth's moon and about 18 other moons, a few asteroids, and numerous Kuiper Belt Objects. How would students memorize all of those planets? They wouldn't, answer Runyon and his colleagues. Instead, they should focus on the organization system of the solar system. "Understanding the natural organization of the Solar System is much more informative than rote memorization," says the paper. "Teaching the zones of the Solar System from the Sun outward and the types of planets and small bodies in each is perhaps the best approach." There are many who feel that the revised planet definition adopted by the IAU is technically flawed, since it doesn't address extrasolar planets or wandering 'rogue' planets - and, again, there's the whole zone clearing requirement, which many experts say no planet in our solar system can satisfy. When I spoke with Stern about this last year, he didn't mince words. "Astronomers aren't experts in planetary science, and they basically passed a bunch of B.S. off on the public back in 2006 with a planet classification so flawed that it rules the Earth out as a planet, too," he said. "A week later, hundreds of planetary scientists, more people than at the IAU vote, signed a petition that rejects the new definition. If you go to planetary science meetings and hear technical talks on Pluto, you will hear experts calling it a planet every day." "Planetary scientists call lots of round things planets, including Pluto and Titan," he said. "If, in linguistics, definition is influenced by usage (especially by experts in the field), then by usage alone Pluto is a planet." Runyon also feels this new definition can and should be used without needing ratification by the IAU. "We don't need to give the IAU the authority to tell us what a planet is," he remarked. "To be fair, the IAU serves a great purpose in astronomy and does great stuff, but they don't need to tell planetary geologists what a planet is or isn't." Runyon admitted that some planetary geologists are okay with the IAU definition, and others don't really care. Some can't understand why it's a point of contention. "For whatever reason, this is something that I care deeply about," he said, "I think partly because I want the general public to support space exploration and how they view the solar system affects their interest level." That's illustrated in the implicit assumption in the question Runyon said he gets often: Why did you send a spacecraft to Pluto if it's not a planet anymore? It's as though "non-planets" cease to be interesting enough to warrant scientific exploration, the paper says, although this wasn't the intention of the IAU. Runyon said that he chose to submit this paper as a poster at the upcoming Lunar and Planetary Science Conference in the K-12 education section, because he wants teachers to teach this new definition, as he sees this as the most influential way to get the public to adopt it. "Get 'em while they're young!" he quipped. 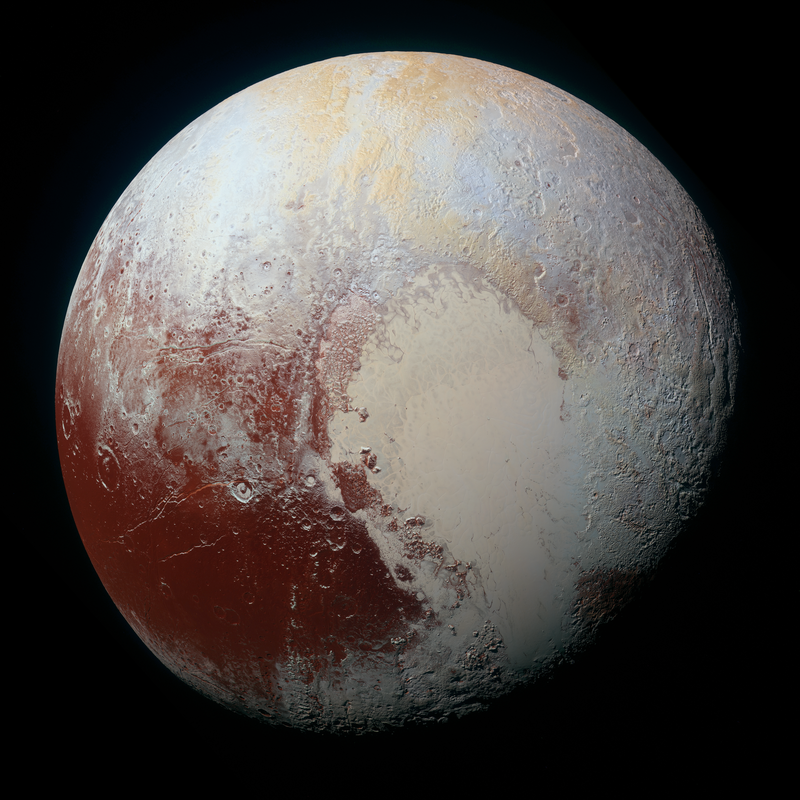 Top photo: NASA's New Horizons spacecraft captured this high-resolution enhanced color view of Pluto on July 14, 2015.